An 18-year-old Monk has been arrested by the Chinese authorities in Ngaba, in the County of North-Eastern Tibet. The monk from Kirti monastery was staging a peaceful protest against the Chinese rule in Tibet. Since his arrest, his conditions and whereabouts remain unknown. The monk is one of the many Tibetans who is being arrested and imprisoned for calling for equal rights. Dharamshala - Chinese authorities in Ngaba County of north-eastern Tibet Friday have detained a Tibetan Buddhist monk for staging a peaceful solo protest by shouting slogans such as "freedom and equal rights for the Tibetans in Tibet" and "the return of His Holiness the Dalai Lama to Tibet." "Gedhun Phuntsok, a 18--year-old monk from Kirti monastery was arrested while staging a solo protest in the street of Ngaba township shouting slogans— protesting against Chinese rule in Tibet," Ven Kanyak and Lobsang Yeshi, from the India based Kirti Monastery told the Tibet Post International (TPI) on Sunday afternoon. "Phuntsok walked about for few minutes in the street (About 1:30 pm local, March 8, 2015) while raising a portrait of the Tibetan spiritual leader with a yellow Tibetan scarf, shouting slogans such as "Equal rights for Tibetans in Tibet" and "the Return of His Holiness the Dalai Lama to Tibet," the source said citing contacts in Tibet. "Chinese security personnel arrived at the site of the protest after few minutes," they said, adding "after that he's disappeared." The sources said that "after the arrest his condition and whereabouts remain unknown. "Her father's name is Tagya, and her mother's name is Rig-go. Phuntsok is a native of Chayultso Chukley Gabma village, Ngaba County in Amdho Region of north-eastern Tibet Tibet (Ch: Aba County, Tibetan and Qiang Autonomous Prefecture in the north-west of Sichuan Province). He became monk at a young age at Kirti Monastery where he studied Buddhist philosophy and culture, and Tibetan language. A photo of his proest received from the area also shows the monk staging a lone protest by carrying a portrait of His Holiness the Dalai Lama with a yellow Tibetan scarf. A large number of armed Chinese security forces and police are also deployed onto the Ngaga town streets and surrounding areas during the past few weeks. 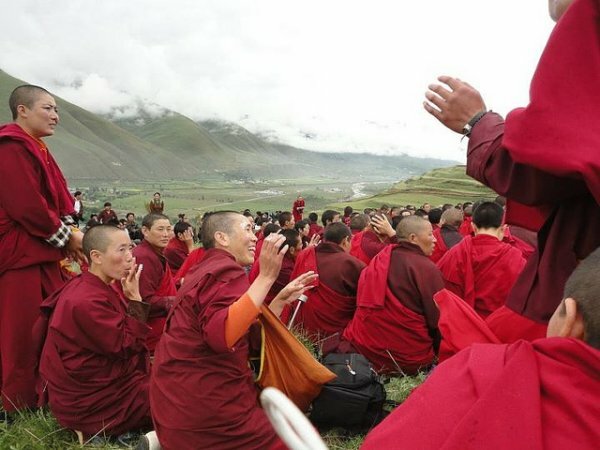 The sources said that the Chinese government has currently imposed a tight control over the movement of Tibetans, including monks of the monastery. The heightened security presence appears aimed at preventing protests on the coming March 10 anniversary of a failed 1959 Tibetan revolt against Chinese rule. The Chinese regime also has imposed severe restrictions on internet and phone connections by increasing a wider crackdown on communications across Tibet in an attempt to prevent any news reaching the outside world. In Tibet today, Tibetans are being arbitrarily arrested, imprisoned and tortured for merely expressing their suffering under Chinese rule. However, authorities in Beijing still claim that "China 'peacefully liberated' Tibet, and that the "Tibetans are living in a Maoist socialist paradise."